This will be my first Summer Music Camp and I am a private piano teacher, would it work?? Absolutely! In fact, I bet your students will be more excited than most because it'll be new to them. Start talking it up to them while you're in the planning stage. Maybe ask their input on themes or activities - that sort of thing. The more involved they are, the more excited they'll be. Then plan a sign-up incentive. 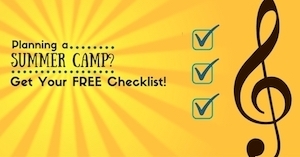 Oh - and make sure you download the free checklist - that'll really help since it's your first camp.